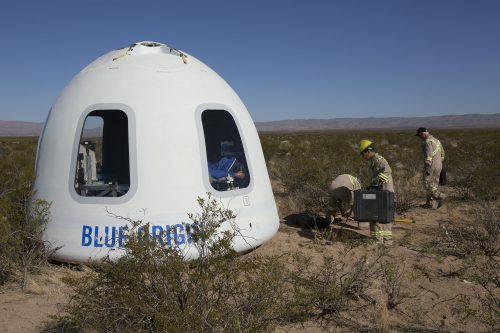 The company — owned by billionaire and Amazon founder Jeff Bezos — tested its New Shepard space vehicle at its Van Horn facility. It’s been just over a year since the company ran test flights for the project. Included in Tuesday’s tests were a new booster system as well as a crew capsule equipped with what the company has said are the largest windows tested for space flight. A test dummy named “Mannequin Skywalker was aboard the test flight, which reached an altitude of nearly 322,000 feet. Blue Origin is developing its New Shepard rocket to hold up to six space tourists, researchers, or experiments on short suborbital flights. This entry was posted in KRTS News, KXWT News and tagged Blue Origin, New Shepard, space fligh, Van Horn. Bookmark the permalink.